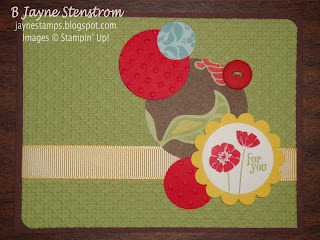 ~ ~ ~Jayne Stamps ~ ~ ~: Punch Bunch is most popular FREE set! Punch Bunch is most popular FREE set! Sale-a-Bration has just started and I'm so excited! Have you seen the adorable items that are available for FREE in the Sale-a-Bration catalog? We have heard that Punch Bunch is the most popular SAB set so far. 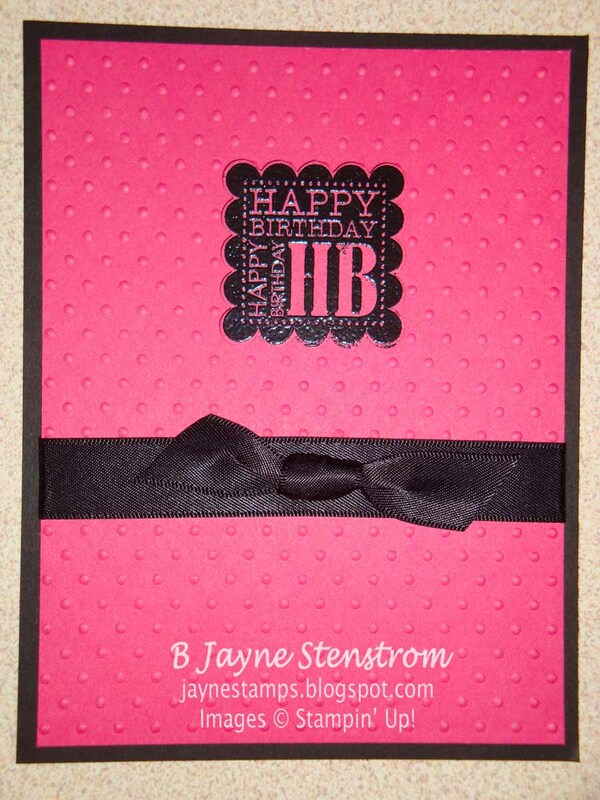 This set has five images that all coordinate with a specific Stampin' Up! punch! I have lots of samples to show you, but I'll just start with a few today. This first card was made by Diane Kipp. Diane is a member of my Chalk-a-holics stamping group and is a wonderful stamper! I love all of her creations. Don't you just love all the textures and shapes on this card? The second card is made by Ann Welborn. Don't these owls just make you want to squeal with their adorable-ness? 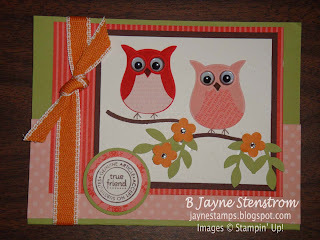 The owl is one of the images in Punch Bunch and the circle on the lower left that says "True Friend" is also one of the images in the set. I love this card and the wonderful colors on it. 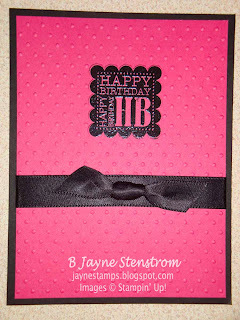 Laura Miller made this card using Basic Black and Melon Mambo. It's simple, but so eye-catching, don't you think? This last card was created by Angelia van der Leek. 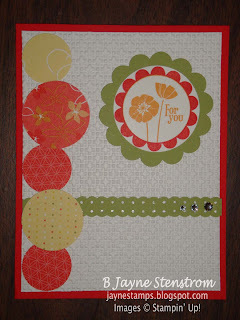 I love the interplay of the different circles and scallop shapes on this card. Sometimes it's the extra touches that make a card stand out. So are you inspired yet? Have you decided that you need this set yet? Don't worry - there will be more samples coming of this and the other items in the SAB catalog. You can't buy these, but you can get them for FREE with every $50 in merchandise that you purchase. Contact me for more details at jayne@jaynestamps.com. Happy stamping! 2011 Desktop Coaster Calendar - Oct., Nov., Dec.